Most of Charleston is familiar with the Aiken family of Antebellum times, whose railroad wealth literally stamped the family’s name across our state, but hardly anyone remembers the “other” Akin family of colonial South Carolina. From modest beginnings in the 1690s to great wealth in the 1750s and then extinction in the 1840s, the lesser-known Akins left an important legacy on Meeting Street that most of Charleston has long forgotten. Before we can appreciate the Akin Foundling Hospital, we need to learn a bit about the family fortunes that inspired our community’s first and only home for motherless infants. The Akin family arrived in South Carolina by 1695, though it’s not clear from where they emigrated. Like the more famous and apparently unrelated Aiken family of nineteenth-century South Carolina, the colonial-era Akins may have hailed from the north of Ireland. In 1695, Thomas Akin purchased 200 acres from Jonathan Amory, another immigrant from Ireland, on the eastern branch of the Cooper River, about 20 miles northeast of Charleston, and rooted the family in what became known as the Lowcountry parish of St. Thomas. By the time he made his will in 1705, Thomas Akin had acquired sufficient real estate to divide more than 700 acres among his three minor sons, John, Thomas, and James. John died in 1729, leaving his estate to his mother, Elizabeth, and his brothers and sisters. Thomas Akin, the second of that name in South Carolina, married one Margaret Livingston and became a planter in the parish of St. John, Berkeley. At his death in 1755, the childless Thomas Jr. left his entire estate to his wife, Margaret, who died in 1757 and distributed the estate among her non-Akin family. James Akin, the first man of that name in South Carolina, was born sometime in the 1690s and became a prominent planter in the parish of St. Thomas in the 1720s. As such, he served as a justice of the peace, a tax inquirer, and was repeatedly elected to represent St. Thomas in the Commons House of Assembly. He acquired additional property by purchase and through the family of his wife, Sarah Bremar (married 1741; died 1750), with whom he had at least four children, named James, Thomas, Elizabeth, and Mary. If James Akin is remembered at all today, however, it’s for concocting a story about a planned slave insurrection in 1749 and torturing his slaves to confess the imaginary plot. The colony was on high alert for a brief moment, until Akin’s neighbors, including his brother, Thomas, persuaded the governor that the threat never existed. At the time of his death in 1758, the elder James Akin owned dozens of enslaved people and more than 5,500 acres scattered across the Lowcountry, but it’s unclear whether or not he also owned a townhouse in Charleston. I believe he acquired a house on the west side of Meeting Street, opposite the Congregational meeting house, before his death in 1758, but I can’t find any documentation concerning how or when he acquired that property. We’ll return to that point in just a minute. When the widower James Akin died in 1758, his four children were still teenagers. Supported by a sizeable family fortune and a well-heeled network of friends and family, however, the Akin children did not suffer for want. Elizabeth lived in urban Charleston, apparently with the Harleston family, and died unmarried in 1763. Mary Akin married George Smith, the son of the Reverend Josiah Smith (senior). James Akin, the second man of that name in South Carolina, married Ann DeVeaux in 1764 and followed in his father’s footsteps by acquiring even more real estate and representing the parish of St. Thomas in the General Assembly. Thomas, the younger son, married Ann Christie in 1768 and also became a planter in the parish of St. Thomas. In short, the Akins were a well-established, affluent family by the time of the outbreak of the American Revolution in 1775, but there also signs that the family fortunes were in decline well before the war began. A lot of land in Meeting-Street, opposite the White Meeting; containing about thirty-four feet in front, and two hundred and thirty-six and an half in depth, having a convenient tenement thereon, consisting of six rooms: Which, with a little repair, may be made a very good dwelling-house, with a brick kitchen, a well of very good water, and other improvements. This lot is as airy and pleasantly situated as most in town, having a considerable space of gardening land to the back parts thereof, with the Meeting and Old Church-Yards open to the front, which will always give it the advantage of that free air, so requisite in summer. 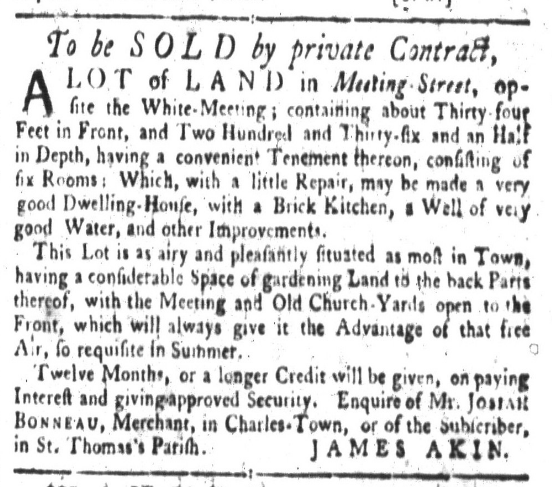 From these brief descriptions, and the general context of the Akin property advertisements, it appears that the house and lot on the west side of Meeting Street was part of the large estate of the first James Akin, who died in 1758. The house was occupied by a tenant in 1771 and needed a bit of repair, so we don’t know if it was ever used as an Akin family residence or if it was simply an investment property. In either case, the younger James Akin wanted to dispose of it because he needed the cash. For reasons now lost, his finances were in steep decline in the mid-1770s. On at least three occasions, in 1774, 1775, and 1777, James borrowed large sums of money from Charleston merchants, during which time he continued to represent the parish of St. Thomas in the Commons House and in the new House of Representatives. In 1779, brothers James and Thomas Akin jointly sold four tracts of land totaling more than 2,300 acres. When the childless James Akin Jr. drew up his will in the spring of 1780, just before the British siege of Charleston, he bequeathed his two principal plantations to his wife and her family. The rest of his property was to be divided among the children of his younger brother, Thomas. James died sometime in 1780, and his will was probated in Charleston in early 1781, while the city was under the yoke of British occupation. Shortly after the conclusion of the war, in the spring of 1784, the creditors of the late James Akin filed suit against his widow, Ann DeVeaux Akin, to recover their unpaid debts. The court ordered the confiscation and sale of Akin’s principal tract, containing 1,271 acres called Akinfield, which was purchased by his neighbor, John Huger. With Ann’s death in 1785, a major chapter in the Akin family saga came to a quiet end. Far less is known about Thomas Akin, the younger son of the first James Akin, who was born sometime between 1744 and 1747. At the start of the American Revolution, he owned more than 2,000 acres of land, but like many men of that wartime generation, he felt compelled to make contingency plans for the future of his growing family. Thomas made his will in early 1778, instructing his wife, Ann, to maintain only their home place in the parish of St. Thomas, consisting of about 305 acres, for her future support. The rest of his estate was to be liquidated and the profits applied to the support and education of their three children: James and Elizabeth, both born around 1773, and another Thomas, born around August 1776. To advocate for the children in the patriarchal society of the South Carolina lowcountry, Thomas appointed three male guardians: his brother, James, his brother-in-law, Jacob Deveaux (ca. 1740–1803), and his neighbor and family friend, Rev. Robert Smith (1732–1801). Like his older brother, James, Thomas Akin died sometime after the British siege of Charleston, and his will was probated shortly after that of his brother, in the late spring of 1781. At the end of the American Revolution in 1783, the family of the late Thomas Akin struggled like everyone else to recover from years of physical, financial, and emotional stress. “To bring order out of confusion was no easy matter,” remembered Dr. David Ramsay, who would have known the Akin family; “the eight years of war in Carolina were followed by eight years of disorganization.” During this difficult time, the Akin children were very fortunate to have their mother, Ann Christie Aiken (1752–1831), as well as a well-connected guardian, the Reverend Robert Smith, rector of St. Philip’s (Episcopal) Church. The exact nature of the relationship between the Akin family and Reverend Smith is difficult to determine from the distance of more than two centuries, but they were more than simply neighbors. Like James Akin, Smith was elected to represent the parish of St. Thomas, where he owned a plantation, in the South Carolina House of Representatives in 1775 and 1776, but he resided principally in Charleston and declined to serve. Smith likely married Thomas Akin and Ann Christie at St. Philip’s Church in 1768, and likely baptized their children in the 1770s. Thomas Akin could not have selected a better guide for the future of his three children. As a Cambridge-educated gentleman, Robert Smith was both a patriotic veteran (having been exiled to Philadelphia in 1781 by the British) and a clergyman with a zeal for education. In the summer of 1785, Robert Smith opened a private “academy” for young men at his commodious house, the parsonage of the parish of St. Philip (now No. 6 Glebe Street). Here, the Anglican reverend offered instruction in reading, writing, arithmetic, geography, as well as Latin, Greek, and French to a mix of days students and boarding students. This academy, really an advanced grammar school, formed the nucleus of the College of Charleston, which formally commenced in 1789 under Smith’s leadership as a publicly-funded, liberal arts secondary school (what American’s might call a “high school”). For James and Thomas Akin, aged twelve and nine respectively in 1785, the timing of these educational developments was very fortuitous. By the time the boys reached adulthood in the 1790s, and took possession of their respective inheritances, they were prepared for successful careers in the disciplines of their choosing. The young James Akin (1773–1846), the third man of that name in South Carolina, was drawn to the visual arts. Like his slightly younger contemporary, Charles Fraser, he probably studied the basics of drawing and engraving with Thomas Coram, Charleston’s resident self-taught artist who had a strong connection with Rev. Smith and the Charleston Orphan House (founded 1790). Of these two artists, Dr. David Ramsay later noted that “Thomas Coram has merit as a self-taught engraver, and James Akin has obtained distinction in the same art, but not withstanding has found it for his interest to seek the reward of his ingenuity elsewhere than in the land of his nativity.” In fact, James Akin was practicing as an engraver in Philadelphia as early as 1794, perhaps following a European tour. His transition to the city of brotherly love might have been facilitated by his former guardian, Robert Smith, who developed important contacts there while exiled by the British army in 1781–82. Akin’s artistic career in Philadelphia flourished, and he developed a particular reputation as a talented satirist and political cartoonist. He didn’t forget his South Carolina roots, however. 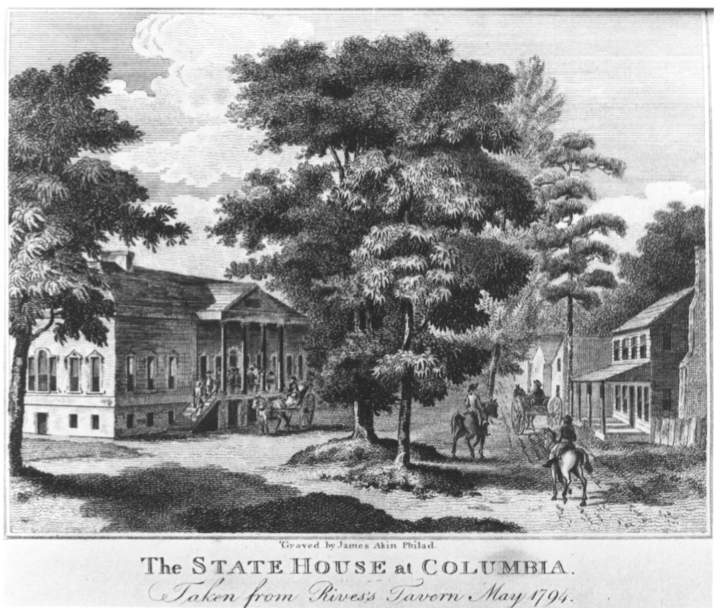 In 1802, Akin engraved the only known image of the first State House in Columbia. A few years later, for David Ramay’s two-volume History of South Carolina (1809), he engraved an imaginative facsimile of the first printed map of Charleston, published by Edward Crisp in 1711. I could say much more about James Akin’s career in the visual arts, but I’ll leave that to Allison Stagg, an art historian who’s working on that project right now. At some point in the 1790s, young Thomas Akin (1776–1841), the third man of that name in South Carolina, went abroad for his education, but the exact duration and itinerary of his travels are not known. We do know, however, that he earned a medical doctorate in 1799 from the University of Edinburg in Scotland, where he completed a Latin thesis on canine rabies. By 1802, he was listed in the Charleston city directory as a practicing physician. Shortly after his return, Dr. Akin joined the Medical Society of South Carolina. By 1808 he was part of the monthly rotation of visiting physicians at the Charleston Dispensary, the city’s free clinic for indigent patients. In 1810, he joined forces with Dr. George Hall to open a private infirmary on the west side of Back Street (now Franklin Street), opposite the Marine Hospital, for the “reception of sick and wounded negroes.” In 1819, Dr. Akin was elected president of the Medical Society of South Carolina. In June 1821, Charleston’s City Council appointed him to the board of commissioners of the city’s Poor House, a position he held for many years. In short, Thomas Akin was an educated, well-connected man about Charleston who used his talents and resources to improve his community. Of the Akin boys’ sister, Elizabeth Akin (1772–1842), far less is known. Eliza, as she was known in Charleston, never married, and opportunities for spinster women were very limited during her time. I think it’s possible that she volunteered with a philanthropic organization called the Ladies Benevolent Society, which was formed in 1813 to assist poor women and girls who needed aid and protection, but I haven’t yet pursued that lead. Eliza might have lived with her mother, Ann, over the years, perhaps dividing their time between the family’s sole remaining plantation in the parish of St. Thomas and their sole surviving property in urban Charleston. The wooden house on Meeting Street, advertised for sale by the late James Akin in 1769 and 1771, apparently passed to the children of his brother, Thomas, after 1781, as his will had directed. That building, which was probably constructed before 1758, endured the Revolution and survived through the years to the 1840s, at which point it became the focus of the Akin family legacy. Before his death in 1841, Dr. Thomas Akin, a lifelong bachelor, left instructions for his sister, Eliza, to take possession of the house and lot in Meeting Street, “where I now reside.” Personally, I think Thomas and Eliza probably shared the house anyway, since both were unmarried, but, again, we know very few details about Eliza’s life. At any rate, Eliza spent her final months contemplating the future of the old Akin place, which was nearly a century old by the time she made her will in the spring of 1842. In that document, she composed a detailed plan that reflects an intimate knowledge of the city’s efforts to care for the urban poor. Eliza conveyed her most valuable possession, “a two story double tenement of wood, nearly opposite the Circular Church,” on the west side of Meeting Street, to the City Council of Charleston with a singular condition: “In trust, nevertheless, that they, the said City Council of Charleston, do within two years after my decease, establish and found thereon a suitable Hospital for the reception and maintenance of Foundlings within the Parishes of St. Philip and St. Michael in the said state [of South Carolina], until they arrive at the proper age for admission into the Orphan House of the City of Charleston.” In short, Eliza Akin single-handedly established Charleston’s first and only foundling hospital in 1842. The Akin Foundling Hospital was an important, but short-lived institution in downtown Charleston designed to meet a need that once existed in our community. To do justice to the memory of this long-forgotten edifice, I thought it proper to begin its history with a tour of the people who made it possible. The Akin family line in South Carolina, established in 1695, disappeared in the spring of 1842, but the name might have lived on for centuries. 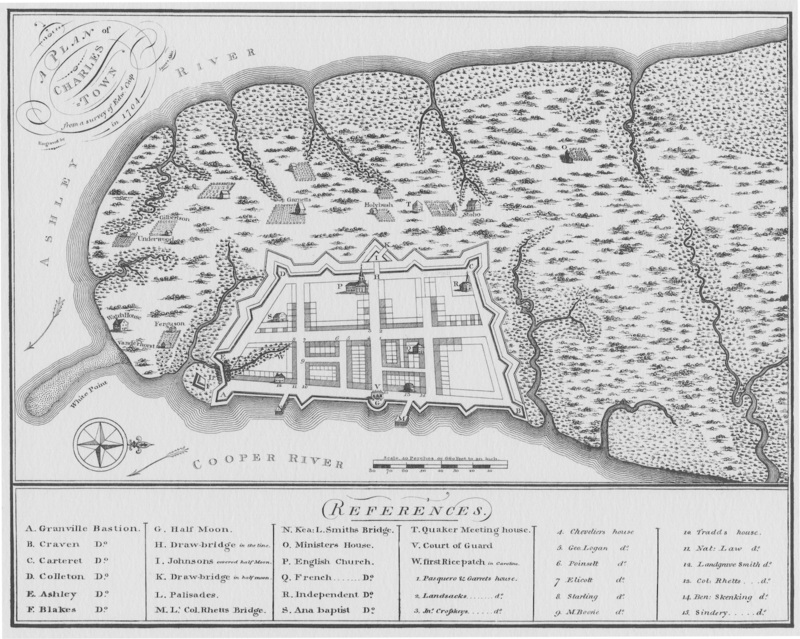 After all, everyone in Charleston remembers the Roper Hospital, established by a private bequest in 1845, so why have we all forgotten the Akin Foundling Hospital? Tune in next week, when we’ll return to the site of the old Akin home on Meeting Street, and explore the rise and fall of the Akin Foundling Hospital. The details of the Akin family holdings on the east branch of the Cooper River, 1695–1784, the principal place called Akinfield (just south of Rhett’s Hagan plantation), are discussed in Henry A. M. Smith, “The Baronies of South Carolina, XVI: Quenby and the Eastern Branch of Cooper River,” South Carolina Historical and Genealogical Magazine 18 (January 1917), 28–29. The 1705 will of Thomas Akin does not survive, but it was mentioned in June 1729 conveyance, Charleston County Register of Deeds, Book I: 49–58. The will of John Akins [sic] of Berkeley County is dated 17 January 1720/1 and was recorded on 6 June 1729; see Charleston County WPA transcript volume 2: 6–7 of Will Book G (1729–31). Will of Thomas Akin of St. John’s Parish, Berkeley, is dated 15 July 1749 and was proved on 15 May 1755; see WPA Will transcripts, volume 7: 485. The will of Margaret Akin of St. John’s Parish, Berkeley, is dated 23 October 1756 and was proved on 7 January 1757; see WPA Will transcripts, volume 8 (1757–63): 5-8. For an overview of the 1749 plot, see Bertram Wyatt-Brown, “The Mask of Obedience: Male Slave Psychology in the Old South,” American Historical Review 93 (December 1988): 1228–52. James Akin (d. 1758) represented the parish of St. Thomas in the South Carolina Commons House of Assembly, 1725–30, 1742–45. Walter Edgar and N. Louise Bailey, eds., Biographical Directory of the South Carolina House of Representatives, volume 2 (Columbia: University of South Carolina Press, 1977), 27–28. The will of James Akin is dated 22 October 1758 and was proved on 17 November 1758; see WPA transcript vol. 8 (1757–63), pp. 226–36. The will of Elizabeth Akin of St. Philip’s Parish, “spinster,” is dated 23 February 1763 and was proved on 23 September 1763. She left the bulk of her estate to her nephew, John Lloyd Waring, and did not mention the Akin family. All her wearing apparel was to be given to her slave Mary, who, along with another slave, Thomas, were to be manumitted on 1 January 1775 if they “behave and demean themselves to the satisfaction of my said executors and also to the liking of my nephew John Lloyd Waring.” WPA Will transcripts, volume 11 (1767–71): 105–7. James Akin (1743–1781) represented the parish of St. Thomas, 1772–76. Walter Edgar and N. Louise Bailey, eds., Biographical Directory of the South Carolina House of Representatives, volume 2 (Columbia: University of South Carolina Press, 1977), 28–29. D. E. Huger Smith and A. S. Salley Jr., eds., Register of St. Philip’s Parish, Charles Town, or Charleston, S.C., 1754–1810 (reprint; Columbia: University of South Carolina Press, 1971), 187. See South-Carolina Gazette, 26 September 1768. This advertisement, which included property totaling 4,796 acres, was repeated for several months. See South-Carolina Gazette, 28 September 1769. This advertisement, which included property totaling 5,596 acres, was repeated for several months. See South-Carolina Gazette and Country Journal, 23 July 1771. The will of James Akin is dated 30 March 1780 and was proved on 23 February 1781; see WPA transcript volume 19 (1780–83), 140–41. For the sale of his plantation, see South Carolina Weekly Gazette, 14–17 July 1784; and Daniel Stevens, Sheriff of Charleston District, to John Huger, conveyance, 5 August 1784, in Charleston County Register of Deeds, K5: 433. James Akin II had borrowed money from Josiah Bonneau, Peter Slann, and John Wilson, all merchants of Charleston. The will of Thomas Akin of St. Thomas’s Parish, Berkeley County, is dated 5 January 1778. The date this will was proved is not recorded. Based on the dates of the surrounding wills in this book, however, it seems likely that Thomas’s will was proved in late spring of 1781. See WPA transcript volume 19 (1780–83), 189–91. Shortly after making his will, Thomas and his wife disposed of a tract of 287 acres. See Thomas Akin and Anne, his wife, to Thomas Wells, all of the parish of St. Thomas & St. Denis, lease and release of 287 acres (known as the “Middle Tract”) for £500 currency, dated 10–11 June 1778, in Charleston County Register of Deeds, Z4: 207–10. The executors of Thomas Akin (d. 1781) advertised to sell a tract of 646 acres in St. Thomas’s Parish, adjoining land of Rev. Robert Smith, and a tract of 207 acres “about 7 miles from Charleston, on the Goose-Creek road.” See South Carolina Gazette and General Advertiser, 20–23 September 1783; and 8–10 January 1784. Thomas Karwon purchased the tract of 646 acres and resurveyed the property with Rev. Smith and Joseph Purcell, but the titles were not properly recorded. See the affidavit of Peter Taylor, dated 19 May 1785, in Charleston County Register of Deeds, R5: 119–20. David Ramsay, The History of South-Carolina, from Its First Settlement in 1670 to the Year 1808, volume 2 (Charleston, S.C.: David Longworth, 1809), 425, 430. The death of Ann Akin on 1 April 1831 was noticed in Charleston Courier, 2 May 1831, page 2: “Departed this life, on the 1st ult. in the 78th year of her age, Mrs. Ann Akin, relict of Mr. Thomas Akin, formerly planter of St. Thomas’ Parish, deceased.” According to the manuscript burial register of St. Philip’s Church, 1823–1940, page 1, Ann Akin was aged 78 years and 8 months. She had a funeral service “at the house,” performed by Rev. C. E. Gadsden, and was buried at St. Philip’s Church. 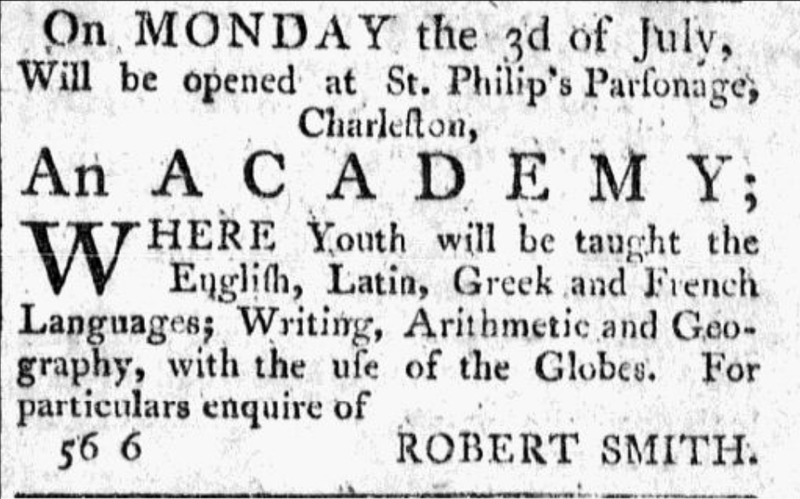 Smith first advertised his academy in the [Charleston] Columbian Herald, 20 June 1785. See also J. H. Easterby, History of the College of Charleston, Founded in 1770 (Charleston, S.C.: College of Charleston, 1935), 20–41. A succinct biography of Robert Smith is found in Walter Edgar and N. Louise Bailey, eds., Biographical Directory of the South Carolina House of Representatives, volume 3 (Columbia: University of South Carolina Press, 1981), 671–73. Ramsay, History of South Carolina, 2: 269. For an overview of his career, see Maureen O’Brien Quimby, “The Political Art of James Akin,” Winterthur Portfolio 7 (1972): 59–112. See the dispensary notice in Charleston Courier, 15 January 1808, page 3. Joseph Ioor Waring, A History of Medicine in South Carolina, 1670–1825 (Columbia, S.C.: R. L. Bryan, for the South Carolina Medical Association, 1964), 152, 337, 343, 347, 348. See the minutes of the commissioners’ meeting on 11 June 1821, Records of the Charleston Alms House (Poor House), 1800–1923, at CCPL. The will of Thomas Akin is dated 27 June 1837, and was proved on 5 June 1841; see WPA transcript volume 42A (Will Book 1839–45), 288–90. Besides a number of small legacies, Dr. Akin also gave to his executors (Eliza Akin and Richard H. Lining) “my servant Caty or Catherine” and “my servant Betsy and her two small children Sarah and Jane in trust with the request that they will protect them as long as they may live and allow them to dispose of their own time as far as the laws of the state will permit, so that without being free, they may be spared as much as possible from the hardships of servitude.” According to the City of Charleston Return of Deaths, now at CCPL, Dr. Thomas Akin died of a “sore throat” during the week of 30 May–6 June 1841, and was buried at St. Philip’s Church. His age is listed as 64 years and 10 months (thus born ca. August 1776). An announcement for the funeral of Dr. Akin appears in Charleston Courier, 4 June 1841, so he must have died the previous day.